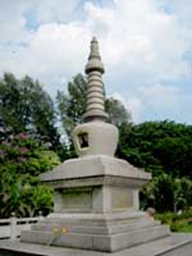 Stupas are memorials of Enlightenment. When the Buddha knew he was entering nirvana, he gave instructions that his body was to be cremated and his relics to be divided and enclosed in stupas. These holy monuments were designed with deep symbolism and sacred geometry. There are two relic stupas in KMSPKS. One commemorates our founder Ven Sik Zhuan Dao. The second stupa is dedicated to the second abbot of the monastery Ven Seck Hong Choon. A landscape with stupas becomes more calming, peaceful and joyful. Filled with Buddhist relics and holy objects, circumambulating stupas brings immeasurable merits and quickens one’s path to Enlightenment. Circumambulation is done by walking around in a clockwise direction, keeping one’s right towards the stupa.